And mingling their music with the grey thrush's song. Wreathing bright garlands in each leaf-spangled bower. A paradise make of the green woods in spring. 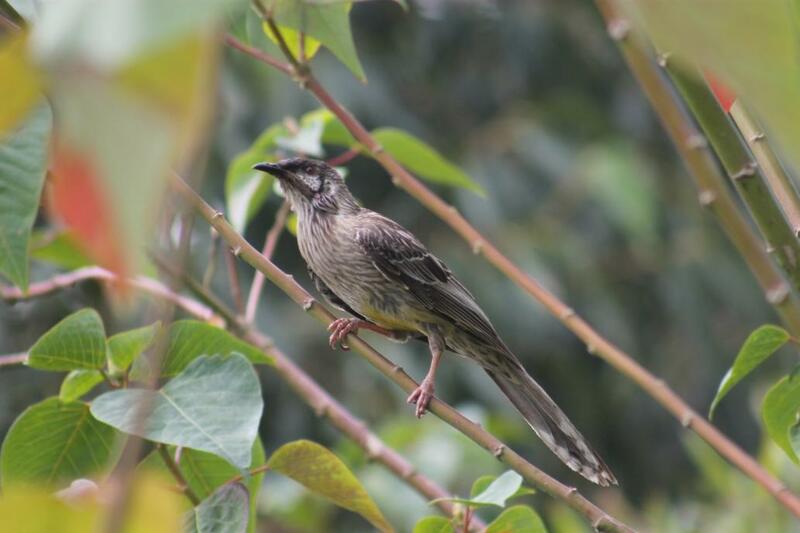 The Red Wattlebird (Anthochaera carunculata), also known as Barkingbird or Gillbird, is a honeyeater; a group of birds found mainly in Australia and New Guinea which have highly developed brush-tipped tongues adapted for nectar feeding. The tongue is flicked rapidly and repeatedly into a flower, the upper mandible then compressing any liquid out when the bill is closed. Although honeyeaters look and behave very much like other nectar-feeding passerines around the world (such as the sunbirds and flowerpeckers), they are unrelated, and the similarities are the consequence of convergent evolution. 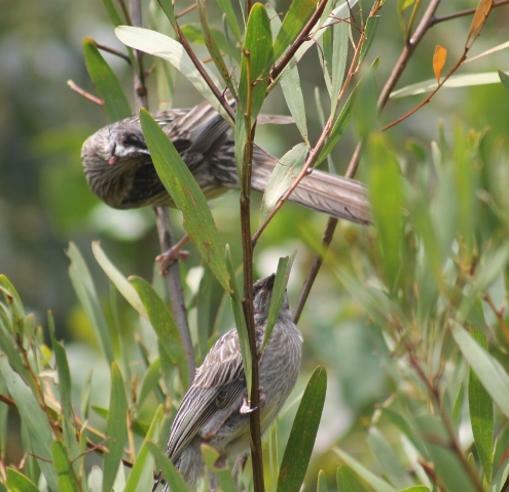 The Red Wattlebird is a large (up to 35 cm) grey-brown honeyeater with red eyes, distinctive red wattles either side of the neck and white streaks on the chest and belly, which reveals a bright yellow patch towards the tail. Juveniles are generally less flamboyant, with less prominent wattles and browner eyes. The species is found in SE Queensland, New South Wales, Victoria, South Australia and southwest Western Australia in open forest, woodland, and near human habitation. The nest is formed from sticks and leaves lined with bark and hair, between 2 and 16 meters above ground, usually in the forked branches of a tree or shrub, in which two or three, pale brown-spotted pinkeggs are normally laid. In addition to nectar, it takes insects and other small creatures, usually by hawking, and also berries and other fruit. This bird was first described by John White in his Journal of a Voyage to New South Wales(1790). 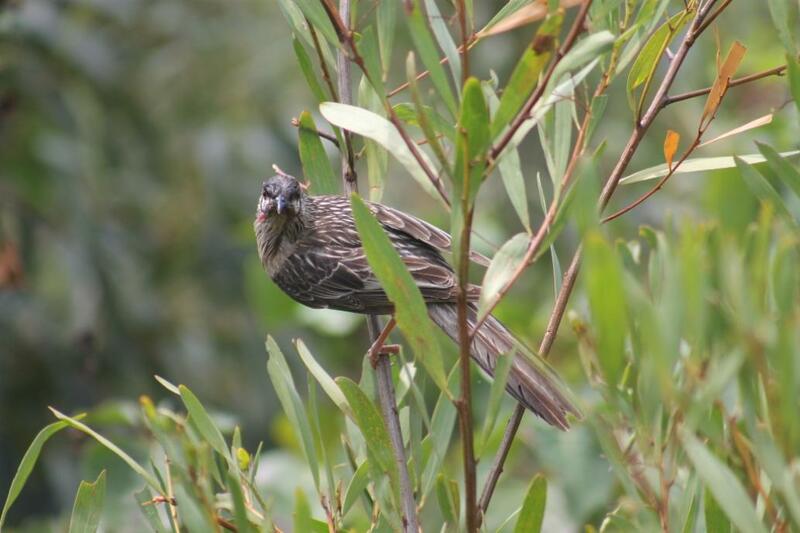 HOW did the wattlebird get its name? The general impression seems to be that the name came to be bestowed because of the sup-posed association of the bird with the wattle tree, but this is not so. It arises from the long fleshy excrescences called wattles that characterise two of the three species of these birds. 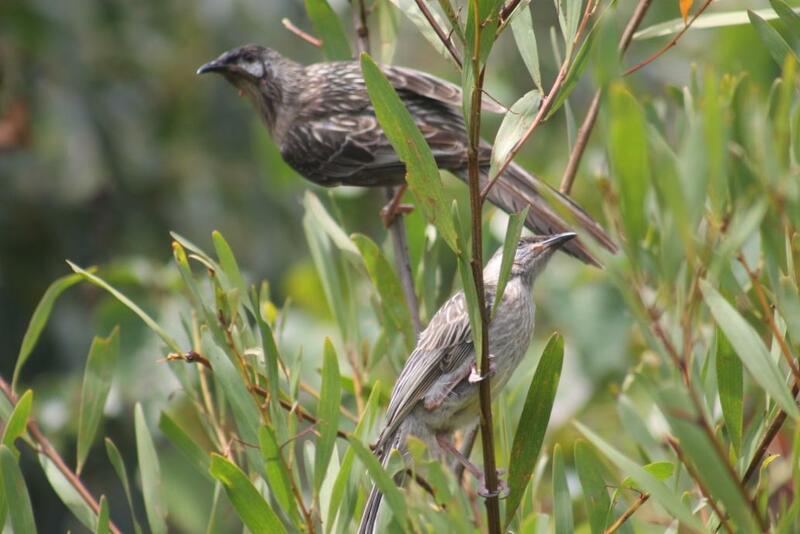 The wattles in the Tasmanian wattlebird are yellow; those of the Mainland species are red, and the brush wattlebird, which occurs in Tasmania and on the Mainland also, is devoid of them. What purpose these wattles serve no one has been able to discover. They may be simply ornaments. We may be interested to know how the wattle tree also received its name.- Generally, it is confined to the well defined and typical tree-growths of the Acacia family, such as silver wattle, black wattle, golden wattle, Cootamundra, Queensland, and certain other allied trees. The pliable nature of the branches made the tree a suitable medium for wattling early dwelling houses and fences in Australian settlements, though the art of "wattle and daub" was known and applied in medieval times. Photos by A J Guesdon, November, 2012.